I love Ninja products. I'm sure you will as well and i'm so happy to share this giveaway with you. One-Touch Intelligence for healthier living, made easy. Auto-iQ™ Technology Auto-iQ™ knows what to do! Unique blending, pulsing, and pausing patterns to deliver consistent, even results every time. Press one button and it's done! Auto-iQ™ programs do the work for you—there's no more need to shake, stir, or mix. Simply select your favorite Auto-iQ™ program and in seconds you're ready to Jump-Start your day! Ninja® Auto-iQ™ Technology is pre-programmed settings with unique blending patterns that deliver smooth consistent results, with no guesswork required. Nutrient & Vitamin Extraction** Extract Hidden Nutrition*** From Whole Fruits and Vegetables. Fit more fruits & vegetables into your daily routine with Nutri Ninja® Power & Performance Blast through ice and frozen ingredients in seconds! Precision Processing Chop vegetables quickly and evenly every time with no worry of overprocessing. 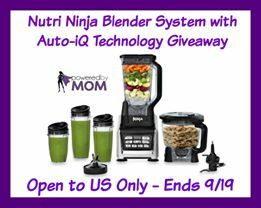 One lucky winner will receive the Nutri Ninja Blender System with Auto-iQ Technology $200 value. I would like to try the blending feature because I could use a good blender! The doctor wants me the start drinking Protein shakes. I bought bone broth that I want to start using, so if I win that the first thing I'm going to make a bone broth shake with some nice veggies. I so want to win this blender, I'm trying to eat healthier and get my fruits and veggies, using this would give great variety. I would first use the single serve cup system to make my breakfast smoothies. I would use the processor bowl first and make almond milk. I would love to make some veggie smoothies for my family. I would like to try the food processor so that I can mix up a batch of cookies. I would use the single use smoothie because I desperately need to get back to my regimen of smoothies for my diet.